Whether it is bottle- or breast-feeding, cribs or co-sleeping, getting back to the office or staying home with the kids, best friends Sara Ellington and Stephanie Triplett, the team behind the popular book and radio show The Mommy Chronicles, rarely choose the same option. Lucky for us, in The Must-Have Mom Manual, they discuss the pros and cons of every aspect of child raising, from pacifiers to potty training, bedtimes to birthday parties, day care to Disney World. Their philosophy is simple: There is no one right way to be a mom. Sara and Stephanie just want to make every mother’s life easier. So, with a healthy dose of humor, they share their parenting triumphs and disasters, marital challenges, public meltdowns, and all the knowledge they’ve gained as authors and radio show hosts, with hundreds of tips for moms everywhere. 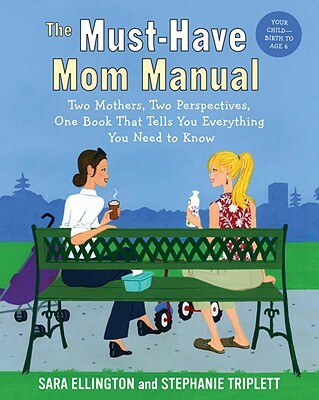 Covering “all things Mommy,” Sara and Stephanie are real mothers delivering real insights, with real laughs, as they tackle and celebrate the challenges and drama of motherhood in the best, easiest, most mom-friendly guide to life with kids today. Sara Ellington has written for Charlotte Ventures magazine, Mothers & More's national newsletter, Forum, and a NASCAR television pilot. Her award-winning advertising work has appeared in The Wall Street Journal, Southern Living, and the Charlotte Observer. From 2005 to 2006 she cohosted The Mommy Chronicles radio show with Stephanie Triplett; they appeared on NBC's Today show and were selected as "spokesmoms" by Johnson & Johnson for a national satellite media tour announcing the birth of the 300 millionth American. Ellington is the coauthor of The Mommy Chronicles and The Must-Have Mom Manual. Stephanie Triplett is the author of The Mommy Chronicles and The Must-Have Mom Manual with Sara Ellington. She has more than 20 years of experience in marketing and has managed the marketing and promotion of everything from television shows and fitness professionals to gas pumps and dog vaccines. She also worked with Sara Ellington to develop The Mommy Chronicles, an hour-long weekly talk radio show for moms that aired from 2005 through 2006 on Sirius Satellite Radio, channel 114.